Preheat oven to 325°F. Line a 9x13-inch pan with non-stick foil or line with parchment paper and spray with baking spray. RAINBOW CAKE BATTERS: Combine cake mix, melted butter, egg and 2/3 cup milk in a mixing bowl. Stir until combined. The batter will be thick like a brownie mix. Equally divide batter into 6 bowls. Color one bowl purple, another blue, green, yellow, orange, and pink. Reserve 1 tablespoon of each colored batter for the top of bars. Spoon teaspoonfuls of colored batter into bottom of pan, alternating colors as you go. Wet your hands slightly and press on the batter, flattening it where needed. Add 1 1/2 teaspoons milk to each of the remaining tablespoons of colored batter to thin them out. CHEESECAKE LAYER: Stir together cream cheese and sugar (or pulse in a food processor). Add egg and vanilla extract and stir until smooth. Pour cheesecake filling over layer of cake batter. Drizzle the thinned out colored batter over cheesecake filling, then swirl using a fork or knife. Bake uncovered for 20 minutes. Cover pan with foil for remaining baking time to keep the colored swirls from browning. Return to oven for 14-20 minutes. Cool at room temperature for about an hour, then refrigerate for at least 2 hours. The center will still jiggle slightly and will firm up as it cools. When ready to serve, cut into 24 squares. Store in the refrigerator. Brighten up any party by serving these festive cheesecake bars! 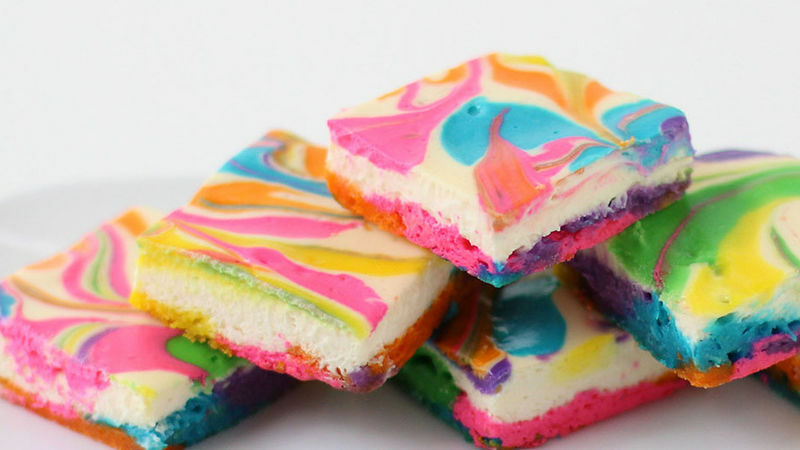 Each treat is topped with swirls of rainbow colors and even has a purple, blue, green, yellow, orange and pink crust. The soft and creamy bars are so much fun—they’ll definitely be a big hit at your next birthday party, potluck, sleepover—or any event, really. This dessert starts with a blondie-style crust made with a Betty Crocker® white cake mix. Divide the thick batter into 6 bowls and color one purple, blue, green, yellow, orange and pink using Betty Crocker® Gel Food Colors. Reserve 1 tablespoon of each of the colored batters, then spoon dollops of the remaining batter all over the bottom of your baking pan. Have fun adding colors in any pattern you like! The batter will be a bit lumpy at this point, so you'll need to flatten it a bit. It's easiest to get your hands slightly wet and use them to press down on the batter. Cover the colorful cake batter with creamy cheesecake filling, then thin out the remaining colored batter with some milk. Spoon small dollops of the thinned batter on top of the cheesecake filling. Then drag a knife through the colors, swirling them as you go. Bake for 20 minutes, then cover with tin foil and bake until the cheesecake sets. Covering the bars will keep the cake batter from browning and provide a bright and colorful dessert. After the baked bars are cooled and then chilled, cut them into squares and serve!